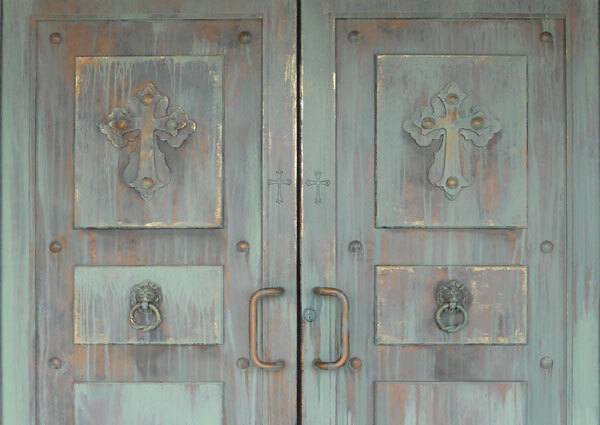 Produce beautiful, Old World verdigris patinas every time with our Verdigris™ paint kits. We've prepared the color scheme for you, but you control the tonal qualities. Perfect for interior and exterior use and may be used over most surfaces. Verdigris™ paint products produce a durable, natural looking, oxidized metal finish over wood, plastic, iron, etc. Verdigris™ materials are a complete system of base coat and color materials designed to oxidize and turn chalky as the different color formulations dry out. Verdigris™ paint kits are available in two base coat metallic paint color choices of 32 oz. of Metallic Bronze or Metallic Copper SetCoat® and 8 oz. Verdigris™ colors in Dark Green, Blue Green and Light Green. Once the SetCoat® base is dry, both Dark Green and Blue Green Verdigris™ colors are applied at random over the entire surface using a brush, sponge, cheesecloth or spray. When dry, Light Green Verdigris™ color is applied. These colors may be thinned with water up to 40% to the desired color appearance. Verdigris™ colors are also available individually in 8 oz. or quart sizes. *Actual color may vary from on-screen representation. Every effort is made by FEI to accurately display all color options. However we cannot guarantee perfect color rendering due to variances in the photographic/printing process, PC/Phone/Tablet displays or individual user settings on their devices. Have you ever wanted to apply an authentic rusted metal effect to decorative ironwork or metal accessories? Old World Rust™ kit is a professional quality, two part system that uses a SAFE, NON-TOXIC, NON-ACID, finishing formula. Part one is a first coat of a textured rusty color that is applied at random. When dry, part two is a glaze of a lighter and not too textured rusty color coat is applied evenly over the entire work-piece, then blotted with a soft cloth to remove any excess. That’s all there is to it! Beautiful and lasting, suitable for indoor or outdoor use.